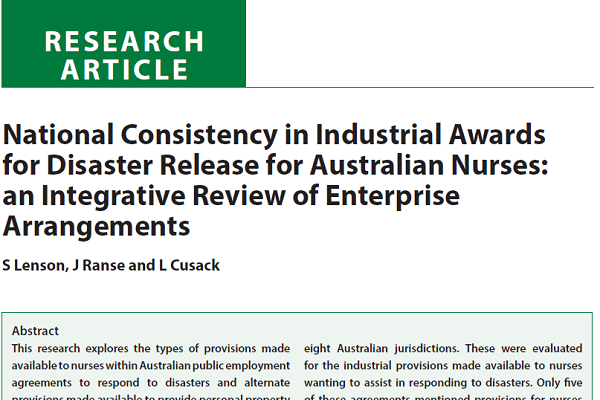 This research explores the types of provisions made available to nurses within Australian public employment agreements to respond to disasters and alternate provisions made available to provide personal property protection and personal care during a disaster. An integrative literature review methodology is used to collect, evaluate, analyse and integrate sources of evidence to inform a discussion on the current enterprise arrangements for nurses with respect to eight Australian jurisdictions. These were evaluated for the industrial provisions made available to nurses wanting to assist in responding to disasters. Only five of these agreements mentioned provisions for nurses to assist in disasters. Where these provisions exist, they vary in their consistency, terminology and the quantity of the entitlements, potentially leading to inequality and variability in the financial support frameworks for nurses involved in disaster events.